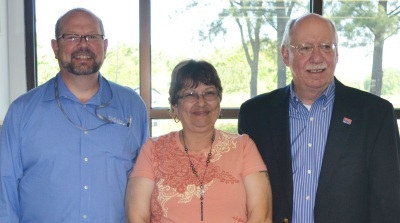 Bernie Carpenter (center) was recognized for 20 years of service at Didlake, Inc. She is shown with Contract Operations Manager Rick Hightower (l) and President and CEO Rex Parr (r). Manassas, VA – On May 11, Bernie Carpenter celebrated 20 years of employment with Didlake, Inc. Carpenter, the project manager for Didlake’s Opal Business Service Center in Fauquier County, was honored with a barbecue and cake at the location, as well as a number of gifts. Carpenter’s staff presented her with a desk clock in recognition of her time with Didlake.